I just spent the last night having the worst heartburn of my life. Thankfully, I survived long enough to make this post and tell the world about YA Literature’s answer to the age-old question: what happens when you take a Simpson’s episode and turn it into a gritty, emotional contemporary teen book? Wait, is there’s no title on the book cover? 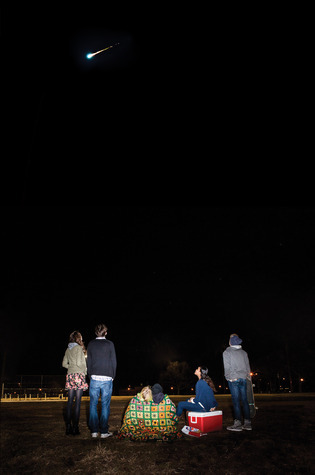 The lives of four teens intersect and overlap several weeks before a meteor is set to pass through Earth’s orbit – with a 66.6% chance of striking and destroying all life on the planet. But when you’ve got a book described as an apocalyptic Breakfast Club, you know it’s going to be good. Which I am totally down for. This is like the epitome of what they mean by high concept comp-title YA Contemporary books. It’s what they always tell you: if you can sell it in an elevator pitch your book is halfway to the shelves. It just sounds like a slam dunk, so interesting, so cool. Is it me, or does Contemporary YA seem to be getting a resurgence of late? Even though contemporary books have always been stable, but perhaps with the success of John Green’s The Fault in Our Stars we’ll see more gritty, contemp books hitting the shelves – and perhaps the movie screens – in the next couple of years. I for one would love to see this as a movie. It would really work. This entry was posted in Uncategorized and tagged john green, monday wishlist, ya book, ya contemporary. Bookmark the permalink.